Seattle’s location in Washington State’s northwest corner means that it’s a perfect base for exploring the area’s natural wonders. Both on land and off-shore. In fact, there’s so much to explore that you could conceivably spend several weeks travelling around by road, train and boat. For instance, to the west is the majestic Olympic National Park featuring the rugged Olympic Mountains. To the northwest Vancouver Island entices with its combination of wilderness and small towns. Meanwhile, Mount Rainier National Park, home to the iconic mountain bearing the same name, is less than a two-hour drive south. But, arguably the drive north provides the best and largest variety of attractions. And they can all conceivably be visited on day trips. Taken together, though, they make for an exhilarating ten-day road trip beginning and ending in the Emerald City. In our opinion, it’s a trip that’s best appreciated if you pack a tent or hire a campervan. And there are plenty of campgrounds to choose from. Not to mention a whole host of places to finish the day with a glass or two of some of the state’s finest craft beers. Of course, before you start your road trip you’ll want to explore Seattle itself. It’s a city that’s compact enough to walk around. Especially if the weather is good. And that’s a big “if” outside of summer. But with spectacular views across the bay to the Olympic Mountains and also Mount Rainier to the south, it begs to be viewed from a decent height. Which the observation deck in the iconic Space Needle certainly provides. As does the Smith Tower, Seattle’s first skyscraper. Or you can get a free panoramic view of the city at Kerry Park. Elsewhere, there’s the famous and historic Pike Place Market with its fish-tossing market stall sellers. There’s also Pioneer Square, Seattle’s original downtown and home to unique tours of the underground passageways. Of course, after all that walking you’ll need to sample a selection of Seattle’s renowned craft beers, preferably at one of their brewpubs. We can especially recommend Cloudburst Brewing near to Pike Place Market and Fremont Brewing over in Fremont. And, while you’re in the vicinity, make sure you seek out the bizarre concrete sculpture of a Fremont Troll clutching a Volkswagen Beetle. If you’ve got any cash left you might also want to try at least one of the city’s museums, of which there are many. We’d heard good things about the Chihuly Garden And Glass museum but opted instead for the Museum Of Pop And Culture. After all, hailing from Merseyside (home to Liverpool and The Beatles) as I do, I’ve always felt a certain affinity with other cities with a musical heritage. And Seattle, the birthplace of Jimi Hendrix and the city that introduced Nirvana et al to a worldwide audience, certainly fits the bill. Indeed, in the museum, there’s an exhibition dedicated to both Hendrix and Nirvana. There’s also a monumental structure consisting of nearly 700 guitars and other musical instruments to admire. But, on the top floor, there’s a music area where you get the opportunity to play a range of musical instruments in small sound-proofed rooms. Suffice to say, my ten minutes on an electric guitar with the amplifier knob “turned up to eleven” was undoubtedly one of Seattle’s musical highlights of the year. Pity no-one else heard it, really. Ok, so you’ve seen Seattle and it’s time to head out on your road trip. Your first point of call will be Mukilteo, via Interstate 5, to catch the car ferry (leaves every 30 minutes) for the 20-minute journey over to Whidbey Island. The small town’s other notable claim to fame is that it’s home to the largest building in the world by volume – the Boeing Everett Factory. There’s a museum – The Future Of Flight Aviation Center – and a tour of the factory if that’s your kind of thing. Once you’ve arrived at Whidbey Island you’ll travel northwards on what is part of Washington State’s Cascade Loop – an epic 440-mile road trip that crosses the North Cascade Mountains, much of which can only be completed during summer months. Along the way, stop off and wander around a couple of lovely historic coastal towns, Langley and Coupeville. In addition to Langley’s restaurants, breweries and early-20th Century shop fronts there’s the chance to visit the Whale Center to learn about the orcas and grey whales that forage around the island. And you’re encouraged to ring a bell at a nearby observation point should you happen to spot one offshore. Meanwhile, Coupeville’s gorgeous old buildings, shops, eateries and wharf are worth an afternoon of anyone’s time. As are the town’s famous Penn Cove mussels. But the island’s real gem lies at its far north tip. Deception Pass is the state’s most-visited National Park and spans the tips of both Whidbey and Fidalgo Islands. Connected by the iconic Deception Pass Bridge, the park contains trails, campgrounds, beaches, tidepools and stellar views. Many visitors just park up beside the bridge and take in the view but you could easily spend multiple days here exploring the many trails, both in the park and surrounding area. Don’t miss the walk along the rugged coastline from Lighthouse Point to Rosario Beach, watching out for seals, porpoises and American Bald Eagles. For more information, check out our article, All You Need To Know About Hiking Near Deception Pass. 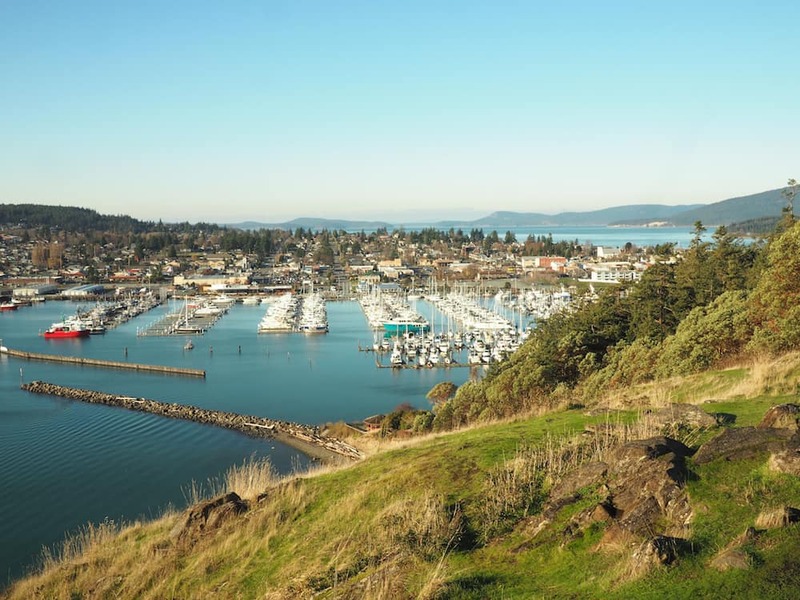 At the northern tip of Fidalgo Island sits lovely Anacortes. With a bustling marina and ferry connections to both the San Juan Islands and Vancouver Island, it’s the major activity hub for the area. So, whether you fancy a few hours’ whale-watching or simply kayaking around its stunning coastline, there’s an opportunity to park the vehicle for a while and get out on to the water. Although that doesn’t come cheaply! Otherwise, there are some good walks around the likes of Cap Sante Marina and up to the viewpoint at Cap Sante Point. Just out of town, you can drive to the trail around Washington Park and to the Mount Erie car park for a more taxing hike up to its summit. As you’d expect, there are plenty of places to eat and drink. But for a “rustic” option try the Shrimp Shack on State Route 20. It’s something of an institution in these parts. Although, despite its name, it’s not exactly a budget option. But when the choices on offer not only include regular items such as Clam Chowder and Fish Tacos but also Blue Crab Burger and Fried Colossal Prawns then I’m sold. In town, the Anacortes Brewery and Brown Lantern are worth a visit for a beer or two. But if you only have the chance to visit one bar we’d recommend The Union Tavern, with its changing range of craft beers and quite possibly the best gourmet hot dogs we’ve ever tasted! From Anacortes, head to the ferry terminal to catch an early (like 6:20 am early) car ferry over to the San Juan Islands. You can actually just rock up at the terminal and join the queue without booking. But, between May and September, you might want to make an online reservation at least a day or so beforehand. Prices are for the round trip to Friday Harbor, San Juan Island and back again via Orcas and Lopez Islands. The journey over by boat is one to savour as Fidalgo Island fades behind under the watchful eye of the snowbound Mount Baker. And, as the pine-clad hills of the San Juan archipelago draw nearer, the route passes through a number of channels between both inhabited and uninhabited islands. Once back on land at Friday Harbour on San Juan Island, take a leisurely drive along the San Juan Islands Scenic Byway. The road circumnavigates the island and passes through most of the main sights. Of particular interest are American Camp and English Camp – two relics from the 19th Century when the British and Americans agreed to a joint occupation of the island. Oh, those heady days of cross-Atlantic cooperation! And Lime Kiln State Park is considered to be one of the best places in the world to watch orca whales from the shore. Of course, you can spend a full day on the island and enjoy a night at one of its campsites before catching a morning ferry to Orcas Island. Or you can catch an afternoon ferry instead and continue your journey along the Scenic Byway. To be honest, we found Orcas Island to be more scenic than San Juan. Especially the drive up to the summit of Mount Constitution and its panoramic views across the islands to the mountains of British Colombia. Craft beer tip: visit the tiny Island Hoppin’ Brewery in Eastsound. While we’d suggest you spend a night on either San Juan or Orcas Island, by catching an early-morning ferry, you could conceivably tour both islands and return to Anacortes in the evening. Back on the mainland, head east along State Route 20 to Burlington, then turn north on to Interstate 5 before getting off at the next junction for Chuckanut Drive (State Route 11). The road then continues through farmland before it snakes its way between the coast and Chuckanut Mountain, with lovely views across Samish Bay to the San Juan Islands. We reckon it’s best appreciated with your speed dial well below the legal limit. And there are some worthwhile gastronomic stops to be had along the way. For instance, stock up on some dough-based goodies by taking a slight detour to the Bread Farm in Edison. And I defy you to try one of their Ginger/Honey/Cardamon Shortbreads without scoffing the whole packet. Further along the coast, The Oyster Bar offers (not surprisingly) oysters and other seafood with complimentary views over Samish Bay. It’s a fine dining experience with a reputation to match. But for more of a DIY experience try the Samish Oyster Bar & Shellfish Market where you can choose from a dizzying selection of seafood and grill your choice on one of the barbecues in the picnic area. The road eventually leads to the coastal university town of Bellingham with its vibrant craft beer scene driven by no less than 15 breweries. If you’ve only got time to visit one (and you really should) I can heartily recommend Aslan Brewing Company. Trust me on this, just order a starter portion of Black Bean Dip with Homemade Tortilla Chips alongside a pint of Batch 15 IPA and the world will suddenly feel like a much better place. Almost a permanent sight from anywhere in this part of Washington State, Mount Baker’s brilliant white peak looms over the area like a beacon of snowbound light. And the good news is that State Route 542 from Bellingham takes you up into the Mount Baker-Snoqualmie National Forest for a much closer look. It’s a 60-mile journey from Bellingham but the road is good and surprisingly light on traffic. Although, depending on what time of the year you tackle it, you might find that its upper reaches are closed because of snow. Indeed, when we visited in May we couldn’t get any further than Picture Lake – which was also covered in snow. 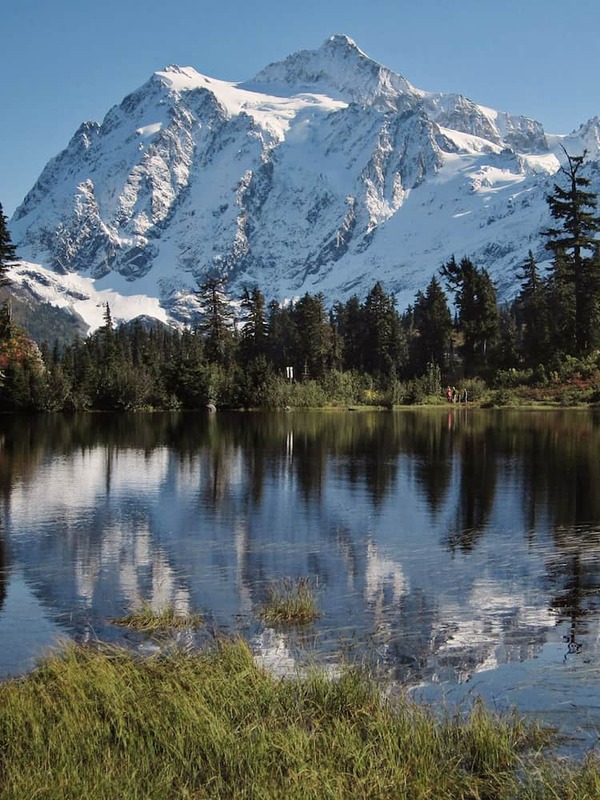 But in the height of summer, the end of the road – or Artist’s Point as it’s called – can be reached for truly phenomenal views of Mount Baker and Mount Shuksan. Nevertheless, no matter how much of it you can access, just enjoy the drive through sublime mountain scenery. Especially when the road climbs above the tree line of the forest. Having retraced your route back along SR 542, take a left on SR 9 until it connects with SR 20 at Sedro-Woolley. A left turn will then put you on the North Cascades Scenic Highway. This is another road that will potentially be closed at some point along the way, depending on the time of the year. But as it passes through the aptly named town of Concrete, the road transforms into another gateway to a gallery of jaw-dropping mountain views. Following its route along the banks of the Skagit River, be sure to stop off at the Howard Miller Steelhead Park near Rockport, which is one of the best places in the state to see American Bald Eagles in large numbers. And it’s a good place to spend the night in your camper, too. Continuing along the highway, the road climbs until it reaches the ridiculously beautiful Diablo Lake. From the off-road viewpoint, the turquoise-indigo colours of the lake contrast with the dark green pine forests surrounding it and the white snow-clad peaks of the Cascade Mountains behind. It’s the best view panoramic view of the whole road trip. And it shouldn’t be rushed. To cap it all, the Diablo Lake Trail features a precipitous gorge with 700-foot waterfalls. And if you manage to complete the full 7 km hike, you can even catch a ferry back along the lake. Just beyond the lake, the road was again closed when we visited in May. But beyond that is The Cascade Loop which you can opt to take during the summer months if and when this section of the road is open. Otherwise, you can turn around and make some stops on the way back to Sedro-Woolley. And don’t miss the amazing Diablo Dam, which stretches across the lake towards its western tip. You can drive across but I’d suggest to park up just before it and wander across by foot. It’s no longer one of the world’s largest dams but I defy you to witness one that’s in a better location. And, when it opens up to let a thunderous cascade of white water drop hundreds of feet into the gorge below, it’s a truly breathtaking sight. Indeed, you’ll still be thinking about it when you stop for a well-earned beer at Birdsview Brewing Company, our final recommended watering hole, just the other side of Concrete. And so, for our final destination, continue back on SR 20 until it meets Interstate 5 and then head south towards Seattle before turning off for Snoqualmie at Everett. Snoqualmie Falls is one of Washington’s most-visited attractions. And with good reason as the 270-foot waterfall once again benefits from a spectacular setting. And fans of David Lynch’s mother-of-all-TV-series, Twin Peaks, will recognise it as the waterfall that features in slow-mo during the opening credits of the original series. Not to mention the hotel at the top of the falls which doubled as the Great Northern Hotel in the same series. There’s a trail down to the base of the falls for a closer look, where there’ll also be fewer people for company. It’s a touristy place for sure. But, as the final stopping point on the round trip to and from Seattle, it’s a fittingly dramatic one, too. As I mentioned earlier, each of the destinations featured in this article can be done separately as day trips from Seattle. Indeed, the San Juan Islands can be reached by ferry directly from Seattle rather than Anacortes. But, for us, there’s nothing quite like the feeling of leaving your home base behind for a few days and having the freedom to explore at will or change plans on the hoof. And in this beautifully wild, mountainous corner of the United States, you really are spoiled for choice. …or visit our USA page. What did you think? Have you been to Washington State? Or perhaps you’re thinking of visiting there in the near future? Either way, we’d love to hear from you so please add your comments below. Washington State is one of our favorites, but there is so much we haven’t even seen yet. This looks like a great road trip for our next visit there! I know what you mean, Bonnie – it’s incredible to think we’ve only seen a tiny corner of the state. An excuse for us to return one day, too! Oh my gosh you covered a lot of territory. this is my home state and your amazing photos made me homesick. I’m glad you were able to admire it’s beauty! Love, love, love! We lived in Washington state for one year, and just loved it so much. The people are so friendly and the scenery is amazing. Did you get as far as Roslyn? It is a tiny town where Northern Exposure was filmed. Really gorgeous shots here and I think this road trip looks amazing. I would love to do it someday! Very detailed post. This sounds like a road trip I definitely need to do. Was lucky enough to visit Seattle a few years ago but regret not being able to see the troll, so a good excuse to go back and get road tripping!!! Our excuse to go back is to see Mount Baker during the summer months and maybe do the full Cascade Loop. Oh, and try out one or two more of those brewpubs! Hope you get to do the road trip at some point, Lizzie. Hope you get to do it one day Faith! We saw a few Hogs doing the road trip they look pretty comfy! Plus, it means you get to sample all the craft beers as hubs would be driving! Thanks for stopping by! Amazing trip. Spent a good bit of time in Seattle and Oregon but missed most of these places–San Juan Islands. Snoqualmie Falls looks great. Thank you! We loved the atmosphere on the San Juan Islands Sue, it was really chilled, which coupled with some stunning scenery made for a great trip! You now have an excuse for a return trip! 10-day road trip planning and this is so great! saw at the beautiful picture is so worth it. I in love with this one! thank you for sharing this amazing post with us. This road trip looks awesome! We are planning to visit that part of the US next year so this will be super helpful – an area I’ve never heard of (other than Seattle, of course). Where did you stay along the way? Hi Rebecca, there are so many accommodation options. We had our own vehicle so we’re able to make use of campsites along the way, although we did stay with friends too and a couple of Air BnB’s. There’s definitely something for every budget. Have a great trip! I love a good road trip, and your Seattle to Mount Baker road trip looks particularly scenic. I’d definitely love to visit Orcas Island, especially since you can combine beautiful scenery with craft beer! For me, there’s only one thing better than combining beautiful scenery with a craft beer. And that’s ordering a second one! This looks awesome – I will definitely bookmark this for whenever I am in the area. We havn’t traveled much in the USA yet. Thanks Jade. You’re in for a treat when you do get to The States! There are so many amazing National Parks to explore! Great itinerary, we are retiring in 5 weeks and relocating from Wisconsin to Arizona. Extensive roadtripping is in our future!! I especially appreciate your appreciation of craft beer. Thanks, Janet. And we’ve definitely got another US road trip or two in us yet. Including taking in plenty more of those breweries, of course. Not been to Arizona yet but that’ll be high on our list when we do return. Enjoy your retirement and especially the road tripping!